"On behalf of the members of the San Antonio Alamo Area Local I want to thank you, and your staff, for the outstanding Retirement Seminar you conducted here in San Antonio. We had an overwhelming response of 125+ members and your presentation was precise and to the point with easy to understand explanations for both the CSRS and FERS eligible members. I also appreciate that the seminar was held with no cost to the local. I especially received excellent feedback on the one-on-one appointments that you arranged for those members who had specific questions and needs. To be honest with you I had expected there to be some sort of sales pitch during the seminar, but to your credit none was made and your presentation was focused on the needs of the members. If needed I will gladly recommend your services to other Unions or organizations. Thanks again..."
"When Postal Benefits Group approached me, I immediately thought here's another so-called group proclaiming their knowledge and desire to help government and postal workers, but really all they want it to take our money. Not so with PBG. I spoke to other Union Leaders, and the Better Business Bureau. I invited them to an Executive Board Meeting. At the meeting I found out they possess expert knowledge of the laws and regulations that govern us. My other concern was sales pressure. They ensured me no one would be pressured to buy anything, and they have kept that promise. PBG truly cares about us as Postal Employees. They respond promptly, are professional and courteous. PBG has helped my members in retirement, insurance, and TSP concerns. No on in my local has reported a bad experience with PBG. When I refer someone to PBG, it's very impressive when they fly in to have a one-on-one meeting. 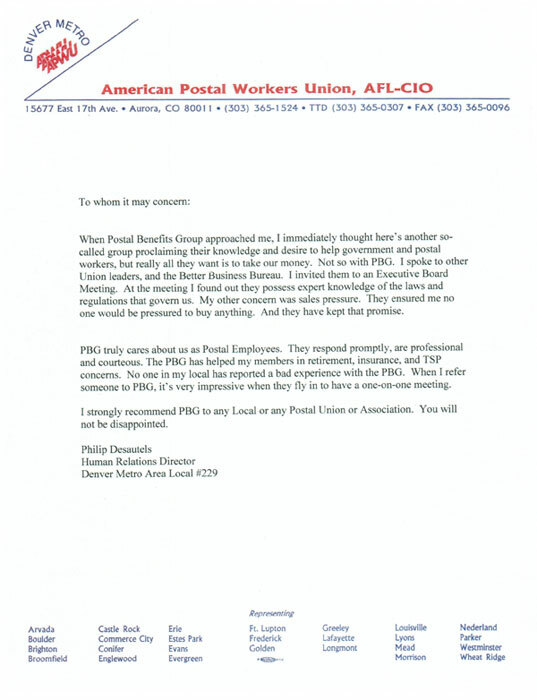 I strongly recommend PBG to any Local or any Postal Union or Association. You will not be dissappointed." "I have worked with Postal Benefits Group over the last two years and have been very pleased with the service and information they provide our members. We have hosted two seminars with them and each time received positive feedback from the membership. The local cannot offer advice and direction on retirement due to liability issues. It is nice to have an organization like Postal Benefits Group to refer to our members to when they need more than basic answers on retirement and benefits. My personal opinion is that they offer a valuable service to Postal employees at a time when they need it most."